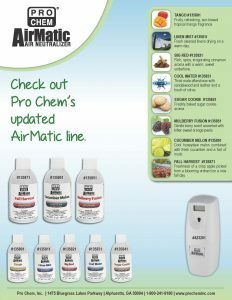 AIRMATIC | Pro Chem, Inc.
AIRMATIC contains powerful neutralizing fragrances that dispel malodors from a variety of sources, leaving a clean, fresh scent. Each can contains 3000-metered sprays that continually freshen the air in an area up to 6,000 cubic feet. 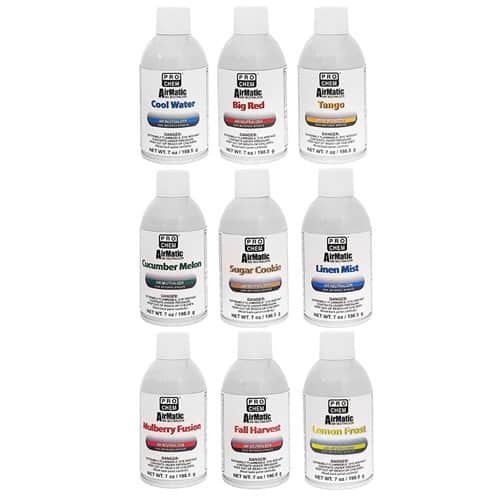 Remove protective cap and install only in a PRO CHEM AirMatic dispenser, which is positioned at least 8 ft. from people, animals, food, drinks, feed, food processing surfaces, or solvent-sensitive surfaces (including polished or varnished materials).